from yourself and what you fear. and once you’ve seen the buffalo graze on Sage Creek they will rumble through your dreams forever. in some kind of love With gorgeous desolation. 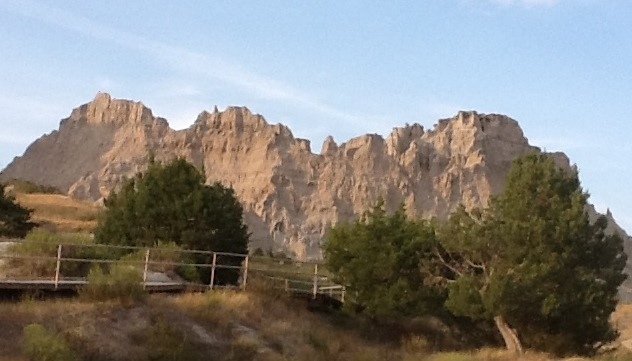 The scorched earth from wildfires along the highway in Montana is nothing compared to the utter desolation of the Badlands only a few miles north of where our son teaches in South Dakota. It is disorienting to see rolling grassland turning to alkali and stark rock tables and spires. There is no where to hide from the brutal transformation. It seems hopelessness may be all that thrives in this loneliest of places where wind chews at the rocks. But there is toughness and remarkable color and diversity too. Hope cannot die where the sunrise and sunset create a portrait of paradise for a few brief minutes twice each day. It is a promise that even the barren can bear fruit.